I know, I know...I'm already doing a skater skirt series this month. I scored this pretty little brocade skirt a week or two ago though and just couldn't put off posting it any longer! This skirt will be great to dress up or down, but for this look I figured I would pair it with a tied chambray shirt because honestly, what else? I'm telling you, this shirt has been one of the most worn pieces in my closet since I bought it (so hopefully you're not too sick of it yet). LOVEEEE this look! You have the sweetest smile too. Me gusta muchísimo tu look!!!! La falda es preciosa y la has combinado a la perfección!! Adore your beautiful feminine skirt, you are so lovely in it, fabulously styled with a denim shirt. 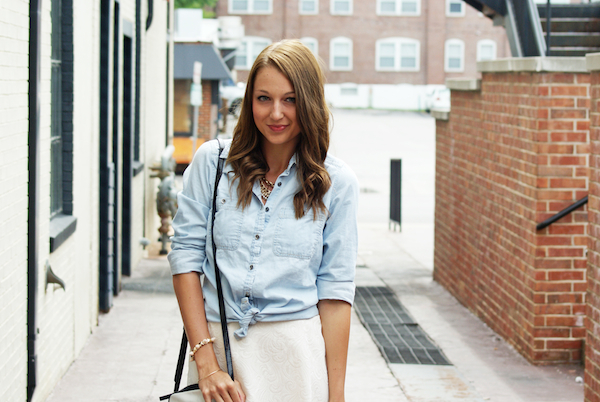 This style of skirt is so cute on you, I love it with the chambray too. Have a good rsst of the weekend! This skirt is so so pretty! ABSOLUTELY LOVE this outfit, it is perfection! AND DAMN GIRL look at those long, beautiful (and tan) legs! Super jealous! OMG this is perfection! I want every single piece - especially that shirt - I need a new one but can't decide on only one LOL. Loving the brocade skirt, it's sophisticated and grown up without being too girlie. I would totes wear this, head to toe! Stunning Jacy! That is such a gorgeous white skater skirt and I love those shoes even more each time I see them! So simple but oh so chic:) And hehe definitely not tired of seeing your denim shirt, I have one too and I wear it so often. They go with everything! Perfect outfit! Love the denim shirt. Looks perfect with that skirt. What a pretty skirt! I love the subtle pattern on it! Cute and simple! I love how this skirt fits, you look gorgeous. Jacy the lighter hair suits you so beautiful! Another one of my favorite looks from you! That brocade skater skirt is simply stunning and you styled it so well:)! That is totally a great skirt for every occasion , love the look. I love this look so much! So light and girly, and the swing skirt looks great on you. P.S. I totally ordered those shoes after seeing them on you, can't wait for them to arrive!